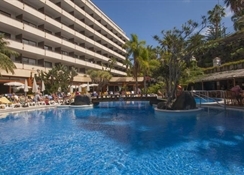 Hotel Puerto de la Cruz rests in the lovely residential area of La Paz in the popular resort of Puerto de la Cruz on the island paradise of Tenerife. Nestled in a splendid subtropical garden, this is a comfortable 4 Star hotel for couples and families both young and old with 300 welcoming guestrooms and junior suites, equipped with modern amenities and facilities as well as a varied entertainment program. 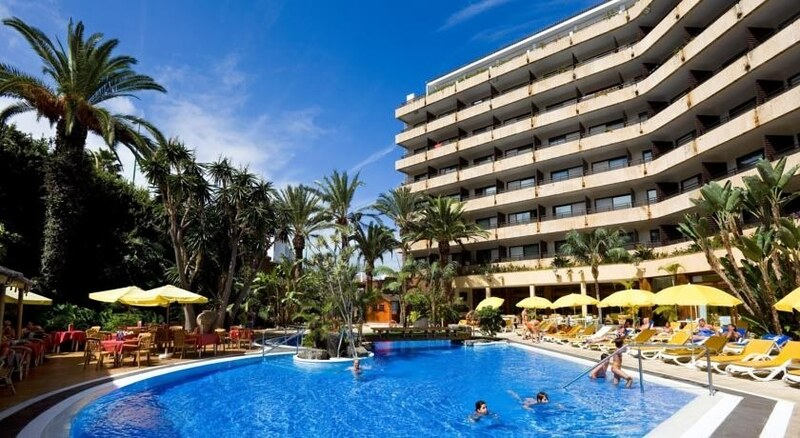 Guests to the Sol Puerto de la Cruz Hotel have access to beaches, shops, restaurants, cafes, bars and vibrant nightlife in Sol Puerto de la Cruz. Tenerife North Airport is 25 km from the hotel. Local Tips: Loro Parque (Parrot Park) is a world-class wildlife-theme park with exhibitions of marine life, penguins, primates, and, of course, parrots. Be sure to check out the flamboyantly landscaped Lago Martianez lido, or the black-sand Playa Jardin beach. Please note the hotel will not accept bookings of minors aged 17 years old or younger unless they are traveling with someone 18 years of age or older. Food, drink and entertainment: Bed and Breakfast accommodation with options for Half Board and All Inclusive. The main restaurant is air conditioned and has an extensive breakfast and dinner buffet with show cooking, as well as theme dinners twice a week. 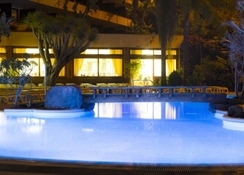 There is a poolside snack bar by the main pool, and the Bar Salon Falua enables guests to enjoy dance music every night and shows like folklore, flamenco, magic and more, several times a week (open from 17.00 to 00.30 hours). New Year's Eve gala dinner available with supplement. 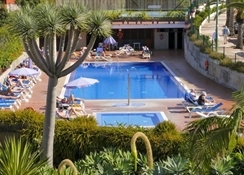 Sports, games and activities: Two fresh water swimming pools, one thermostat-controlled, surrounded by terraces and gardens (renovated in 2008 and 2009 respectively), sun beds and sunshade, towels (with deposit), children's pool and play area, mini gym open from 09.00 to 21.00 hours, massage service (with appointment and with charge), tennis court, table tennis, pool tables, darts, TV and Games room, free entrance to Casinos de Tenerife. Additional: 24-hour reception, room service from 8 am to 10:15 pm, 4 meeting and banqueting rooms for up to 1000 people with audio-visual and business equipment, regular courtesy bus to the town center (except weekends), car rental, Internet Corner (extra charge), WI-FI Internet access throughout the hotel, babysitter and doctor on request (extra charge), night security service, facilities for guests with reduced mobility, parking/garage (subject to availability). 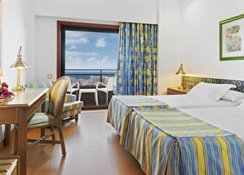 Hotel Puerto de la Cruz Hotel features 252 Double Rooms as well as 37 Singles and 11 Junior Suites with whirlpool. 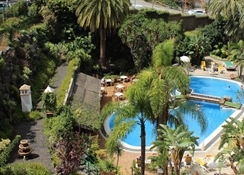 All rooms have a bathroom with hair dryer and amenities, seasonal air conditioning, electronic key cards, Satellite TV, direct dial telephone, Wireless Internet access, mini bar (with charge), safe hire, and a terrace with fantastic views over the sea and Puerto de la Cruz or views of the Teide and Orotava Valley. Connecting rooms, smoking rooms and rooms for guests with reduced mobility (all on request). The All Inclusive program consists of breakfast, lunch and dinner all served buffet style in the main restaurant. House wine, beer, water, juice and soft drinks are offered with meals. Various snacks such as french fries, sandwiches and dried fruit are available between 10.30-17.00. Locally produced alcoholic and non alcoholic drinks are available from 17.00-00.00. The hotel is situated in the residential area of La Paz which is just 5 minutes from the Botanical Gardens and 10 minutes from the city center. 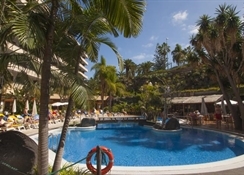 Sol Puerto de la Cruz is approx 28 km from Tenerife North Airport and approx 96 km from Tenerife South Airport.